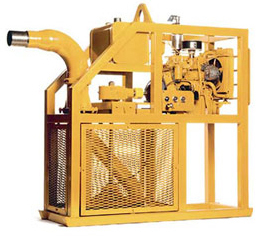 Ditch Pumps Air Compressors ..
High volume centrifugal pump that handles mud, debris and water without clogging. It can discharge up to 2166 GPM (8199 LPM) and is Narrow to fit easily into a normal ditch. Comes with your choice of a gasoline or diesel engine. Draws down to within 3 inches (8 cm) of bottom Few moving parts to reduce maintenance. Rugged welded square tube construction. » For use with all self-propelled clamps and mandrels over 32" (812.8 mm). » Diesel engine with electric start (gasoline engine or electric motor drive optional). 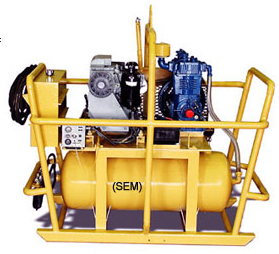 SEM Air Compressors are designed for use with SEM’s pneumatic equipment and come complete with self-contained skid cages. » For use with pull style clamps and mandrels up to 18" (457.2 mm). » Gasoline engine with electric start (electric motor driven optional). » For use with all self-propelled clamps and mandrels up to 32" (812.8 mm). » Diesel engine with electric start (gasoline engine or electric motor driven optional).